There is no doubt that at ‘I Am Starstruck’ we love advocating cultural diversity. And that’s why we are super excited about a new comedy show at this year’s Sydney Comedy Festival… ‘If You’re Reading This, There Is Still Plenty Of Time’! 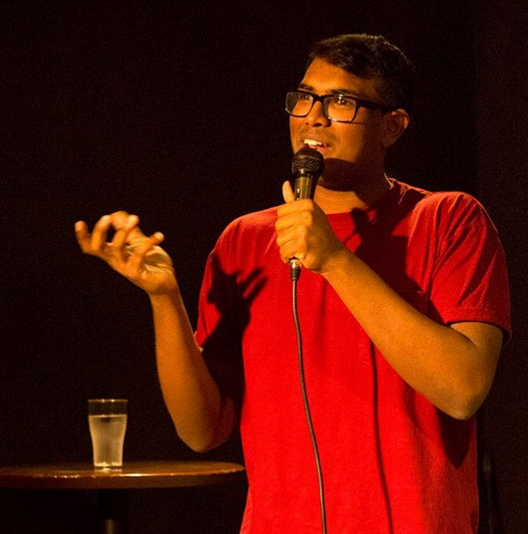 This is the first Sydney Comedy Festival gig for 20-year-old Rowan Thambar, who has previously brought his signature wit and humour to the masses at last year’s Sydney Fringe Festival with the show ‘Brown Identity’. Taking inspiration from his Sri Lankan background and upbringing in Australia, Rowan uses stand-up and musical comedy to get audiences laughing.. and seriously thinking. This rising comedic star has two shows at this year’s Sydney Comedy Festival, so we caught up with him to chat about his trademark show with a cultural twist. I AM STARSTRUCK: How does it feel to have your own show in the Sydney Comedy Festival? ROWAN: It feels really surreal! It was so unexpected when I got the email. I’d completely forgotten about it at that point, so it came as a bit of a shock. The weirdest thing is being in the same festival as people like Matt Okine, Ross Noble and Ronny Chieng who are so big in Australia right now. It’s just bizarre. I AM STARSTRUCK: The show is titled ‘If You’re Reading This, There Is Still Plenty Of Time’. What is your theme for this show? ROWAN: I’m not entirely sure what the theme of this show is. I talk about a whole heap of things. The title is more of a joke rather than talking about anything specifically. But I do talk a lot about growing up, and how I feel already that I’m kind of old. So I guess you could say the show is about ‘coming of age’ and the title kind of links in with that as well. I AM STARSTRUCK: How have you been preparing ahead of the comedic extravaganza? ROWAN: Well I’ve been writing the show since January. It’s all completely new material, different to my previous show ‘The Brown Identity’ which I did all of last year. So new songs, new jokes and also some new, I guess you could say ‘elements’ to the show have been added which I’m really excited about. I AM STARSTRUCK: What can viewers expect from the show? ROWAN: Well, they can expect it to be funny. Because it is…At least I hope it is. They can expect some stories, some songs about a whole heap of stuff. They can expect to get their money’s worth! (Again…hopefully). I AM STARSTRUCK: Where do you get your inspiration for your comedic acts? ROWAN: My life. That’s pretty much where I get most of my inspiration. It’s easy to talk about things that you know really well., experiences that I’ve had, or situations I’ve been in. And each of these experiences are usually universal to a degree, something which other people can connect with, or if they’ve never felt that feeling before at least be aware that people feel like that sometimes. I AM STARSTRUCK: How much/in what way does your cultural background influence the content of your performances? ROWAN: I would say a lot. Some of the things I talk about in my show are experiences that I’ve had as a result of being caught between my Sri-Lankan heritage and my Australian upbringing and mindset. But as I said, I talk about my life and anything that comes out of that whether it be stuff like racism or multiculturalism is something which can be drawn from my life. I AM STARSTRUCK: Since we last spoke to you in September 2014, have you seen any shifts in attitudes towards racism and cultural diversity in Australia and its media landscape? ROWAN: Yes and No. There hasn’t been any massive upheavel of the system and the way we see people portrayed in Australian media. However little things like Nazeem Husain being nominated for a Logie award is pretty cool. That’s definitely a first. But then things like the Waleed Aleed scenario kind of counteract that progress. But I think people might be becoming more aware, which is definitely a positive thing. I AM STARSTRUCK: What changes would you like to see in the entertainment industry in Australia in relation to multiculturalism and ethnic diversity? ROWAN: I’m not too sure really. I think there needs to be less of a fear to cast minority actors as leads in commercials and TV shows. Not just SBS or ABC TV shows but mainstream Australian TV. What’s wrong with having a ‘Packed to the Rafters’ styled show of an Indian family in the suburbs of Sydney? I think a broader thinking in terms of casting and also production of television and film would be cool to see. At the same time though, we need more minority actors and creatives stepping up to fill these roles. I AM STARSTRUCK: Are there any comedians who have inspired you when developing material for your new show? ROWAN: Two of my favourite comedians Aziz Ansari and Louis C.K. both released specials over the last couple of months which were really, really good! But they more inspired me in terms of doing comedy rather than the material for the show. The thing I like about this show is the material is really fresh. I’m excited to show it to people because I think I’ve really started to develop my kind of style. I AM STARSTRUCK: If you could collaborate with any comedian in Australia/overseas, who would it be? ROWAN: That’s a really tough question, there are just so many!! I’d love to work with Nazeem Hussain. I think he’s doing some really cool stuff here in Australia. I’d love to collaborate and do stuff with Aziz Ansari as well. I feel we’d have the same approach to our comedy. And also Hannibal Buress, I feel like he’s someone that I could learn a lot from. Rowan’s debut Sydney Comedy Festival Show ‘If You’re Reading This, There Is Still Plenty Of Time’, will be taking place on May 6 and May 8. Click HERE to grab your tickets.